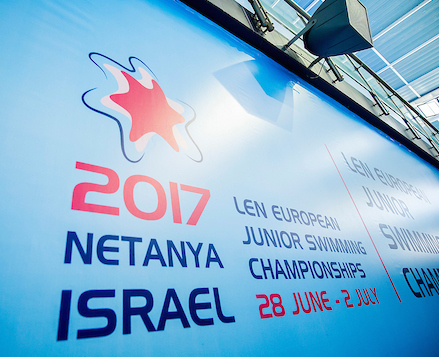 Russians took home all three men’s titles on offer on Saturday at the European Junior Swimming Championships. Kliment Kolesnikov was the hero of the day as he captured two backstroke wins in 53 minutes, first in the 200m, then in the 50m. Hungary’s Ajna Kesely stroke gold once more, this time in the 200m free, this was her 5th triumph in Netanya. Kliment Kolesnikov had a busy afternoon, the Russian backstroker showed up first in the semis of the 50m back at 17.40, qualified in the first place. He was back at 18.31 for the 200m final which he won with ease, then, in 53 minutes he took his marks in the dash final and managed to earn another victory. It was an exciting race where the first three hit the wall in a span of 0.18sec, Kolesnikov was 0.12 faster than Ireland’s Conor Ferguson. The third men’s gold also went to Russia and that final was even more thrilling despite lasting much longer. Iaroslav Potapov (RUS), winner of the 1500m and Akos Kalmas (HUN), the 400m champion staged a neck-to-neck battle. Though the Russian led almost all the way, Kalmar turned first at 600m but later Potapov regained the first place and held it throughout an amazing finish – at the end only 0.16sec separated the two. Denmark’s Katrina Bukh Villesen added the 100m gold after having come first in the 200m two days ago. She edged out Russia’s Polina Egorova by 0.16sec. The Czechs could celebrate their first gold of the meet, thanks to Barbora Semanova who won the 50m free by the same margin as Villesen, but here a Danish, Julie Kepp Jensen missed the gold by 0.16 sec. The session’s end was highlighted by the Italians’ usual enthusiastic celebrations as they came first in the mixed medley relay, ahead of the Russians. Thus Hungary and Russia is tied on the medal table with 9 golds each, the last day promises further thrills but not only for the top nations.